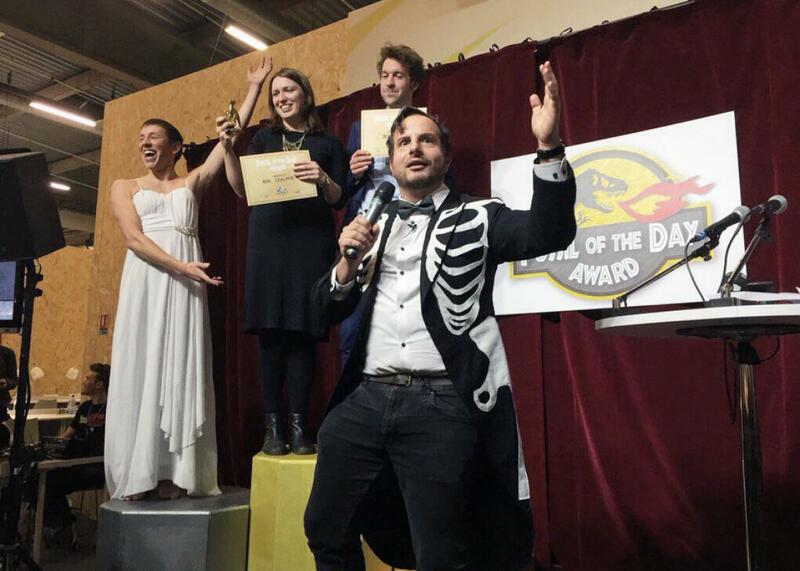 The Fossil of the Day Award wins the Paris Climate Summit. Activists name and shame, with humor. There’s nothing like public humiliation to drive action on climate change. New Zealand and Belgium jointly won the first “Fossil of the Day” award in Paris on Monday. When it comes to saving the planet, public humiliation can be surprisingly effective. Take the satirical Fossil of the Day award, which has a simple premise: Figure out who’s doing the best job at spoiling the Earth’s atmosphere that day, and make a huge deal about it in the most hilarious way possible. The Fossil of the Day has been regularly awarded at climate talks since 1999, flamboyantly presented with a backdrop of a fire-breathing Jurassic Park logo. The awards ceremony has become an essential reprieve from the tedium of jargon and procedure of the climate meetings, and a crucial expression of the activist culture. It’s the best part of the international climate negotiations. Despite being unabashedly fun, the Fossil of the Day also plays a key role in the negotiations by giving the recipient country’s press extra ammunition with which to question its leaders. Past awards have frequently gone to Canada, Japan, Australia, and the United States. On Monday, which kicked off the Paris Climate Summit, Ilic proudly presented the first day’s awards to New Zealand in honor of its Prime Minister, John Key, who on Monday claimed his country was a leader in reducing subsidies for fossil fuels despite increasing subsidies sevenfold during his time in office. An award was also presented to Belgium, since its environment minister missed the train for the opening ceremonies in Paris. But there’s actually an essential function being performed here. After more than 20 years of international negotiations, there’s still no legally binding framework that binds all countries to emissions reductions. Initiatives like Fossil of the Day fill a critical “naming and shaming” role, urging laggards to reform or risk further embarrassment.